How do you ensure that your app will stand out against the avalanche of competing new apps (nearly 2,000 a day)? You need to increase your profile — and get more mileage out of the organic traffic that will make up the vast majority of your installs and your base of quality, loyal users — by optimizing your entire app marketing funnel, not just you app store presence. It's time to forget app store optimization (ASO) and prepare for AMO (App Marketing Optimization). AMO is a new approach that recognizes keywords alone won't cut it. Winning requires a rethink and a sharp focus on all the elements that define and drive the marketing funnel. But this can be a challenge as ASO evolves to consist of more "moving parts" —titles, descriptions, icons, screenshots, videos — and app stores shift rules and algorithms to reward apps that delight their users. 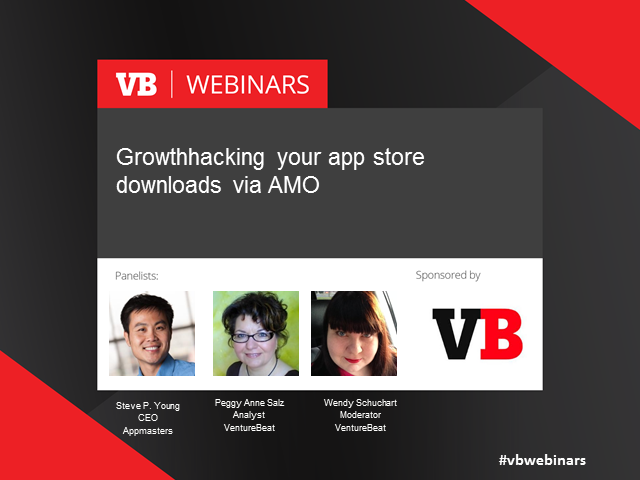 Discover how your app company can benefit from the shift to AMO by attending this VentureBeat webinar, where Steve P. Young, ASO 'wizard' and founder of Appmasters will join Peggy Anne Salz, author of the report, to share his proven growth hacking tips and ways you can take your apps to new heights on a tight budget. *Talk tools, tips and techniques to get your app in front of your audience and top of mind with app stores. *Identify the small changes in components, such as you in-app purchase descriptions, that will have big impact on downloads. *Walk through the differences between Google Play and Apple’s App Store, and map how you should adapt your ASO/AMO strategy for both.